IndiaFlowersGifts.com - Place your order for Nicely Gift Wrapped 50 Red Roses Basket Mixed Dry fruits 500 gms. Haldiram's Soan Papdi 500 gms. a small Teddy Bear and Toblerone bar 4 Pcs with free Gulal/Abir Pouch. 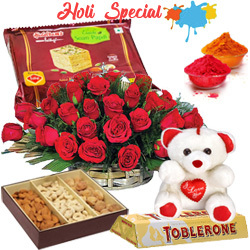 Nicely Gift Wrapped 50 Red Roses Basket Mixed Dry fruits 500 gms. Haldiram's Soan Papdi 500 gms. a small Teddy Bear and Toblerone bar 4 Pcs with free Gulal/Abir Pouch.